MATHS TUTOR HAS BEEN DISCONTINUED! Log on using your network username and the password is the same as Google Apps. ↑ What is Maths Tutor? Maths Tutor is a great educational app that can be used to support learning maths linked to specific domains. It can be accessed via the web or by downloading the app directly onto an iPad or Android device. Please ask permission from a grown up before downloading. Although the domains are not organised by year group, the content is directly linked to the current National Curriculum. Visit the Day Dream Education website for more information about the app. 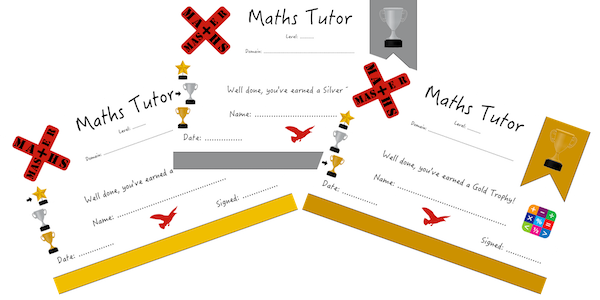 We are keen to recognise your hard work at home as well as in school, so if you earn an award on Maths Tutor, you can ask your grown ups to print out the relevant certificate and get them to fill in the details. Any certificates that we receive will then be handed out in Praise Assembly. Your grown ups may not be able to print out an award every time you earn one, because there are simply so many you could earn! You may decide you only wish to print out Gold Trophies, but the Star Award and Silver Trophies are available if your grown ups would like copies of these. Click on the relevant icon below and print the award (if you have permission). Use the bullet point headings below to help fill in the ‘domain’ section on the certificate and select the correct level. Note: In order to get the Martial Arts Multiplication grades, you must complete the test in school, not simply use Maths Tutor. The app is great for practising however!